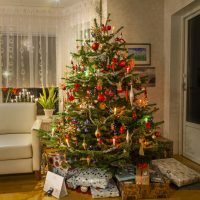 Setting up an artificial tree for Christmas is nice and may give you the perfect tree shape, but nothing can replace the memories made with family when you visit a Christmas tree farm and select a real tree. Setting up a real Christmas tree has been part of the holidays since 1842. That year, Charles Minnegerode set up the first real tree in Williamsburg, VA. When selecting a real Christmas tree, you need to begin by deciding what type of tree you want. There are several different types of trees you can select from; however, Scotch pine tends to be one of the more popular types grown in Indiana. Scotch pines are long lasting and will remain fresh throughout the holiday season. Their needles are approximately 1 inch in length and remain on the tree even after they become dry. White pine is another popular tree in Indiana. It has soft, flexible needles that tend to be longer than most other tree species. Their limbs tend to be more pliable than fir trees. Fir trees tend to have good fragrance, good needle retention, and freshness. They also have strong limbs that will hold ornaments well. This would include the Fraser fir and the concolor (white) fir. Douglas fir have similar features to other fir trees; however, it is not a true fir. Douglas fir have soft needles that are dark green to blue green in color. Their needles radiate in all directions from the branch and when crushed, give off a sweet fragrance. Once you know what type of tree you would like, you need to select a tree that fits the space available in your house. Remember that you do need to allow height for your tree topper and your tree stand. As you are narrowing down your tree options, look for a tree that is fresh (especially if it is pre-cut). If it is a pre-cut tree, run a branch through your enclosed hand. If needles fall off, then the tree is not considered fresh. As soon as you have found your ideal tree, you will want to cut it. Cutting the tree is a two-person job. The individual doing the cutting will need to lie on the grown and make the cut. The second individual will want to hold onto the tree and keep the bottom limbs out of the cutters way. Once the tree is cut, have the tree farm staff shake the tree to remove dry and dead needles and wrap the tree in netting to make transport easier. When you arrive at your house, you need get your tree into cool water. Trees, which have been cut for more than 6 hours, do not absorb water. To help with water absorption, you need to make a fresh cut (removing a half inch of the trunk) before placing your tree in the tree stand. Ideally, you want to utilize a tree stand that holds at least one quart of water for each inch of stem diameter. Lastly, before your decorate your tree, you will want to place it in an area of your house that keeps it away from direct sources of heat. Therefore, you would want to avoid warm air floor vents, wood stoves and fireplaces, hot lights, etc. Avoiding heat allows your tree to stay cooler and avoids drying it out. Over time, you will have to add water to your tree stand. For example, a 7 foot tree may take two quarts of water a day for the first week after being cut. Visit our homepage at www.extension.purdue.edu/putnam or you can contact the local Purdue Extension Office by calling 765.653.8411 for more information regarding this week’s column topic or to RSVP for upcoming events. It is always best to call first to assure items are ready when you arrive and to RSVP for programs. While many publications are free, some do have a fee. Purdue University is an equal access/equal opportunity institution. All times listed are Eastern Time.